He was the great-uncle war hero we never saw (other than in films and that one time on the lawn) but who we loved just the same—as if he were seated with us at the Thanksgiving table every year. We loved him in Hitchcock classics like Rear Window and Vertigo, of course, but who we truly wanted at our Thanksgiving table was Jimmy Stewart as George Bailey in It's A Wonderful Life. 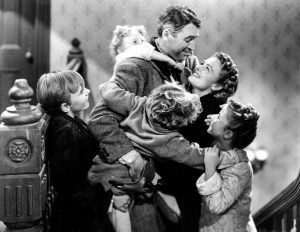 I have, as I suspect many others do this time of year, a tradition of watching It's a Wonderful life on Christmas Eve with my family. Building a fire, cozying into the couch with a glass of wine, and wrapping presents while George Bailey bounds down Main Street in Bedford Falls shouting "Merry Christmas!" is something I live for each year.And this year, we need George Bailey more than ever before. Every good Christmas movie has a Scrooge character and It's a Wonderful Life is no different. 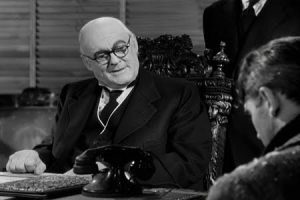 Lionel Barrymore portrays Henry F. Potter, Bedford Falls' villain, with a grit and cruelty we haven't seen since yesterday's headlines regarding our president. ZING! Potter is a greedy, sinister, corrupt, capitalist slumlord who will do anything he can to fill his pockets. He puts his name on every development he owns in town; he cares nothing of other people or their children and families; he bribes, cheats, and steals... and, referring to an Italian man who is friends with George Bailey as a "garlic eater"—he is racist to boot. It's impossible to watch this movie today and not see our 2018 society mirroring back. Greed and opulence as something to frown upon seems like a quaint notion anymore. Everyone is trying to sell us something. Do you have enough stuff? Do you have the right stuff? Have you bought all the stuff? Let's embrace the George Baileys of the world! Donate to your employer's Adopt-A-Family this year if you can afford it, give a dollar or two to that GoFundMe, send a care package to an old friend who's having a hard time, write a letter to your grandma! George Bailey touched so many lives without knowing it, as do we all. We don't need a guardian angel to wipe our neighbors' memories of us—or worse—turn our spouses INTO LIBRARIANS to give us that boost to do the right thing. —Sarah Mathews is an Accounts Assistant at Lawrence Public Library.